Read this article to learn the type of return you can expect to receive on your Madrid property investment. 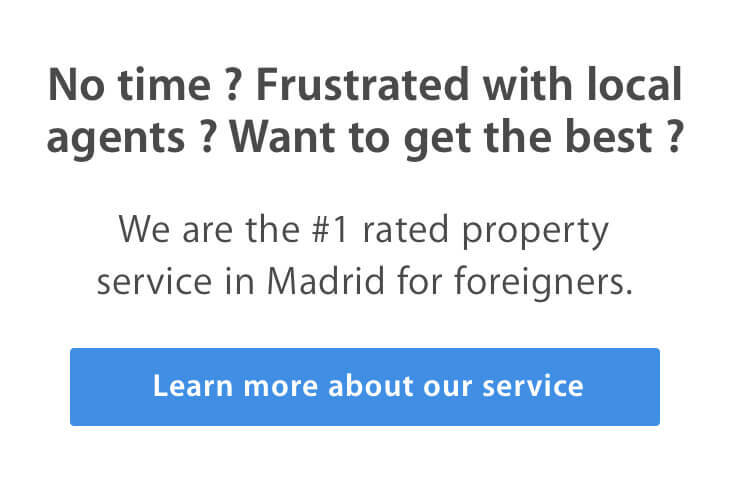 You will see two case studies from current clients to see how investing with Moving2Madrid will give you the best property investment return in Madrid. Summary: If you buy a property in the 375-500k€ range, you can expect to achieve a return far above the Madrid market average of 4.6%. This is done by employing the Moving2Madrid strategy: find an apartment that other buyers would view as “defective,” then mitigate these defects. Its buyer achieves a 4.9% rental yield. Its buyer achieves a 5.2% rental yield. This property is located in the neighborhood of Opera/Madrid de los Austrias, close to the Royal Palace. This 81 m2 apartment was purchased for 396,000€. It has two bedrooms, a full sized bathroom and four windows. It is located on the third floor, on the exterior. The building has an elevator. Additonal closing costs on this apartment were 55,598€. The refurbishment costs for this apartment were 30,000€. The total cost of this apartment, including the refurbishment and closing costs, was 481,598€. This apartment is rented on Airbnb. Its monthly average rental revenue is 2,814€, which equates to 33,763€ per annum. The property costs 10,001€ per year to maintain. Close to 70% of this is property management fees: they are 6,753€ per year. Community fees are 1,020€, gas, electricity and internet amount to 1,628€. The balance goes towards home insurance and taxes. Do you want to achieve a similar best property investment return on your Madrid property purchase? If so, contact us today to learn how. This apartment is located in the trendy neighborhood of Malasaña, in the Center. This lively neighborhood is filled with bars, cafes and restaurants. It is the heart of Madrid’s legendary nightlife scene. This 91 m2 apartment was purchased for 430,000€. It has two bedrooms, one bathroom and five windows. It is located on the third floor, on the exterior. The building has an elevator. Additonal closing costs on this apartment were 60,208€. The total cost of this apartment, including the refurbishment and closing costs, was 526,208€. This apartment is rented on Airbnb. Its monthly average rental revenue is 3,167€, which equates to 38,000€ per annum. The property costs 10,898€ per year to maintain. Property management fees constitute over 75% of this: they are 7,600€ per year. Community fees are 1,020€, electricty, gas and internet fees sum to 1,628€ and the rest of the yearly maintenance costs go to taxes and home insurance. Our case studies demonstrates that Moving2Madrid clients earn returns that far surpass Madrid market averages. We have clients that have purchased apartments in the 275-500k€ range with rental yields in the 4.9%-5.2% range- well above the Madrid average. Do you want to achieve a similar best property investment return on your Madrid property purchase? If so, arrange a FREE CONSULTATION to learn how.